We’ve all had breakthrough moments in our lives. Moments when a switch flicked, a light went on and a door to a new world of great potential and possibilities opened up for us. For most of us, the door was always there to be opened but, for a range of reasons, we never turned the handle. Until that day. Don’t Wait for a breakthrough moment, let us create one! When you focus on getting a little better, you get a lot better over time. And you can build your experience and expertise, on a daily basis, a moment at a time, a chance at a time, and a choice at a time. When the time is right, you need to move. You need to act. You need to strike boldly, swiftly, decisively. 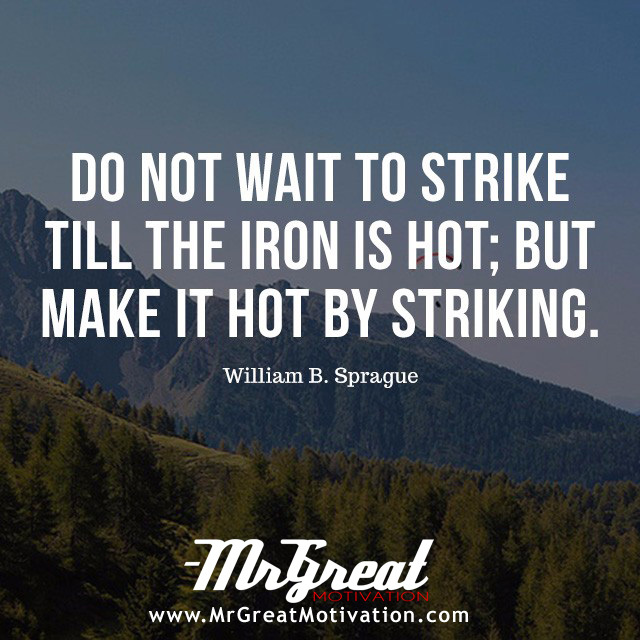 If you fail to strike while the iron is hot, there's a good chance you'll lose your momentum and lose your opportunity. In any case, we have a responsibility to live life and do what is important, at least what we "think" is important to get through any circumstances. Give thanks that if you have the ability to be able to strike, at anything. Do not wait. Go get it. Stay Motivated.